So I set a pretty big goal for myself almost 1 year ago. 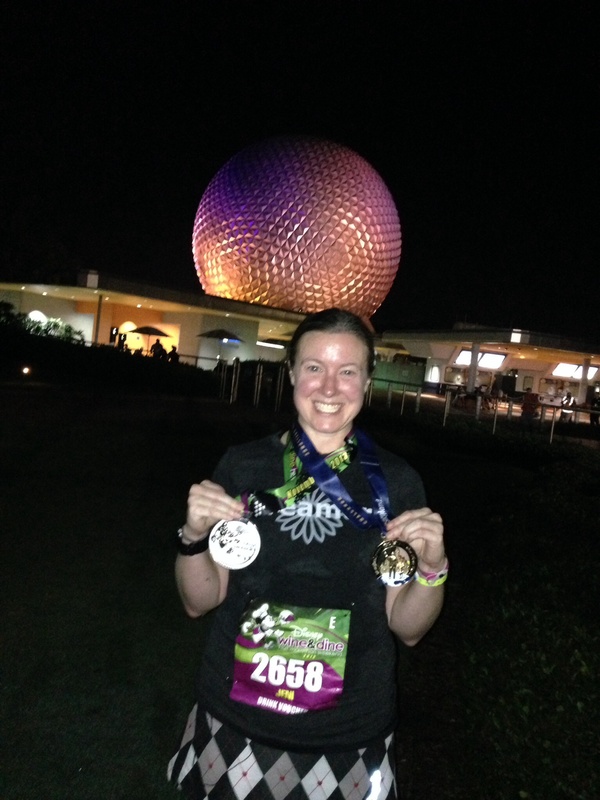 13 half marathons in 1 year. this was a big goal especially since I ran my very first half marathon in May of 2012 and had only ran 4 half marathons. 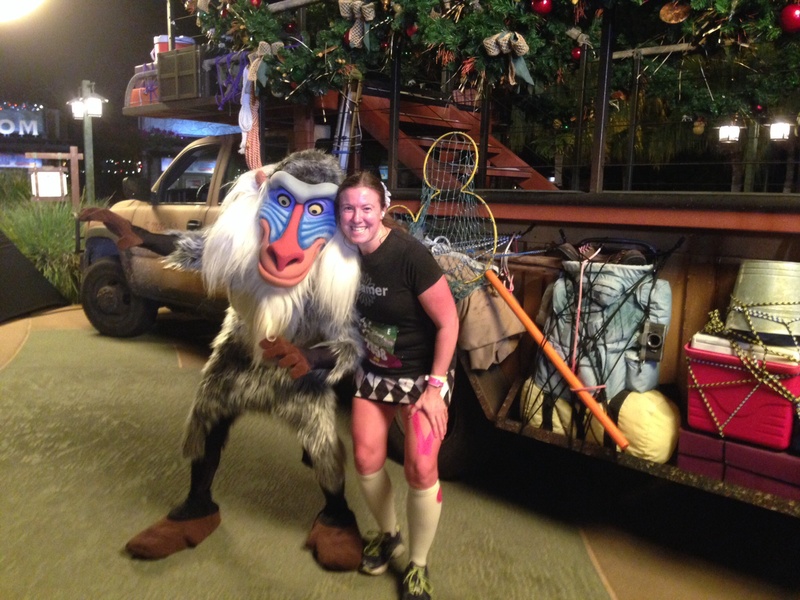 I’ve only been a runner for a few years but I though how cool would it be to do 13 in 2013, i saw a few other bloggers doing it so I though if I could logistically figure it out, I’d try to do it. Still can’t believe I did it, I even count my DNF, only because I started the race, I could have finished, but I needed my injury to heal. 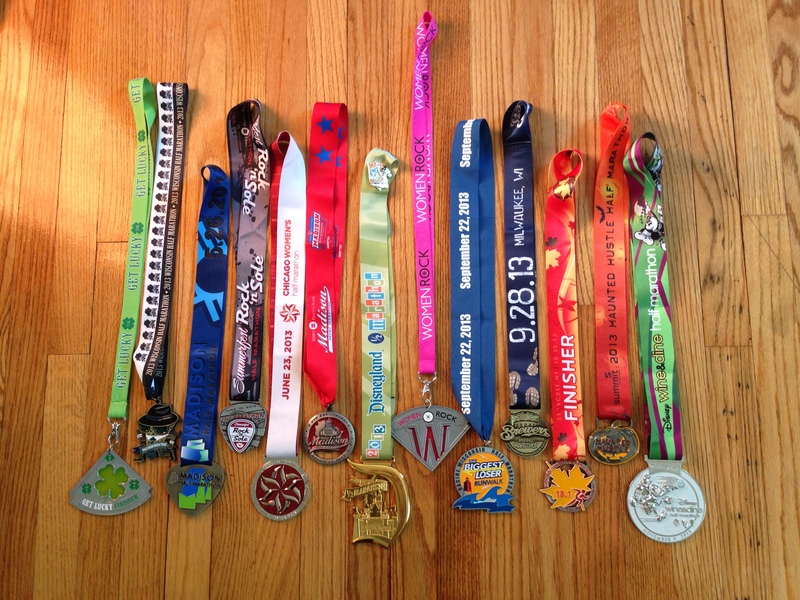 all 13 half marathon medals, look at all that bling! So much planning went into this, cost was the biggest part, I had most of the races paid for by March, as soon as I picked races I looked at their cost and when the cost went up, most of them I signed up when the cost was the cheapest, so I could financially afford this. I also worried about signing up for so many and getting hurt. 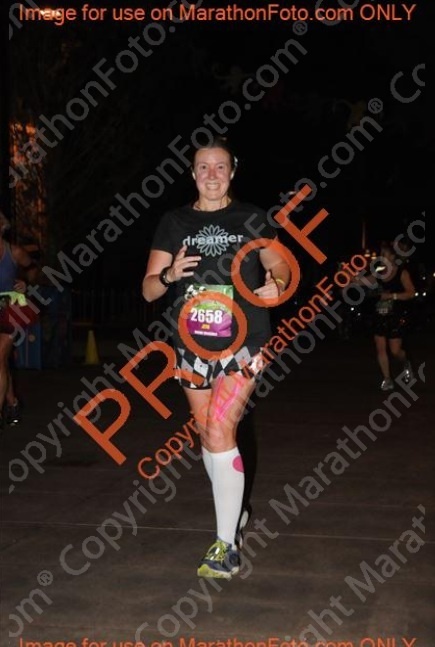 I held off on airfare for some until it was closer to race day so I wouldn’t be out race fee and airfare if I was to get injured or if something else came up. It was a lot of planning and using of a few vacation days here and there, but so so worth it. I’ve been asked if I’ll run this many next year and the answer is no, I will pick 1-2 half marathons to run and that’s it. 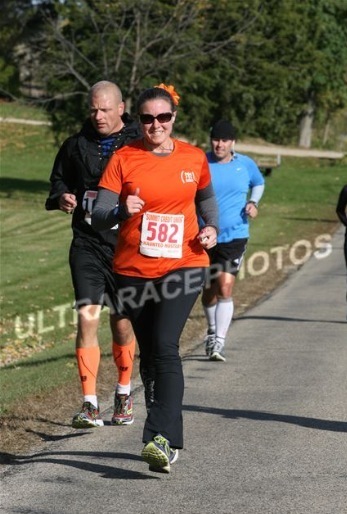 Sticking to 10k’s, 5k’s and a few Ragnar Relays. 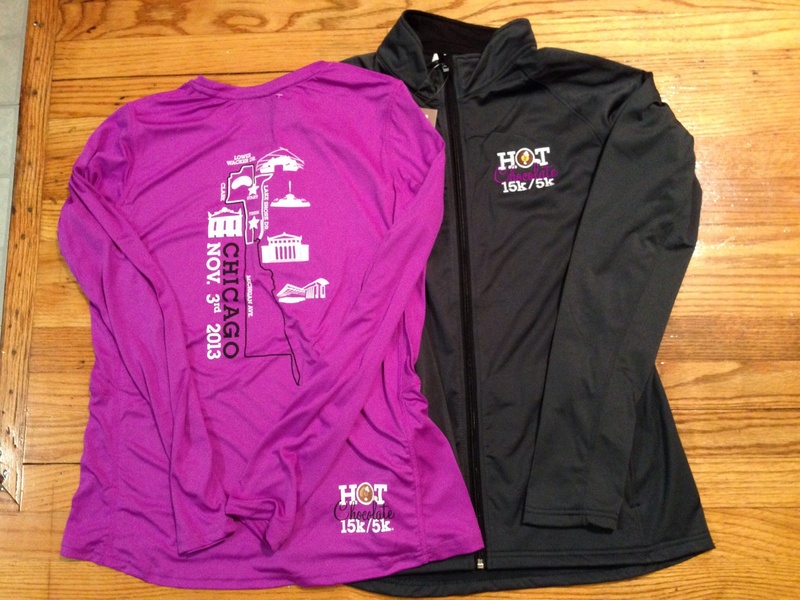 I have my eye set on running 2-3 Ragnar Relays next year, my Madison to Chicago team is already set. 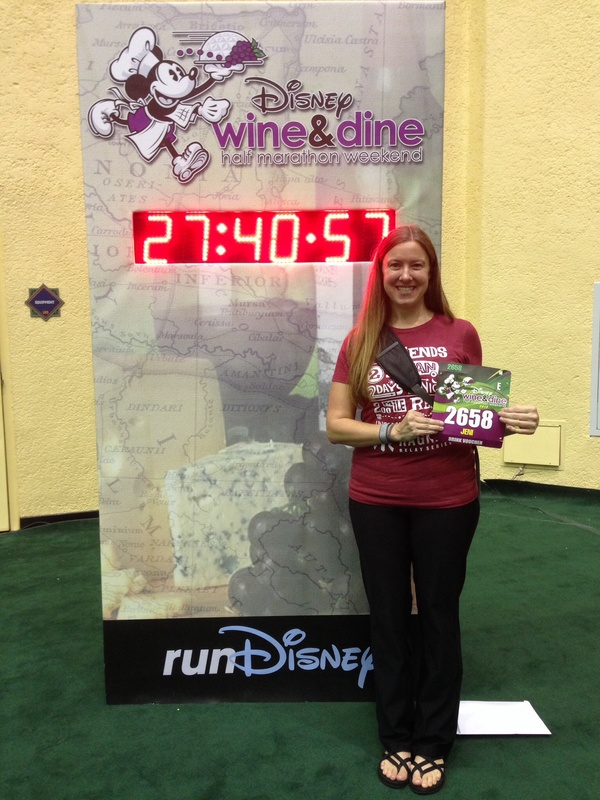 The Disney Wine and Dine half was my 13th half for the year and a great race to end my goal of 13, 13.1’s in 2013. 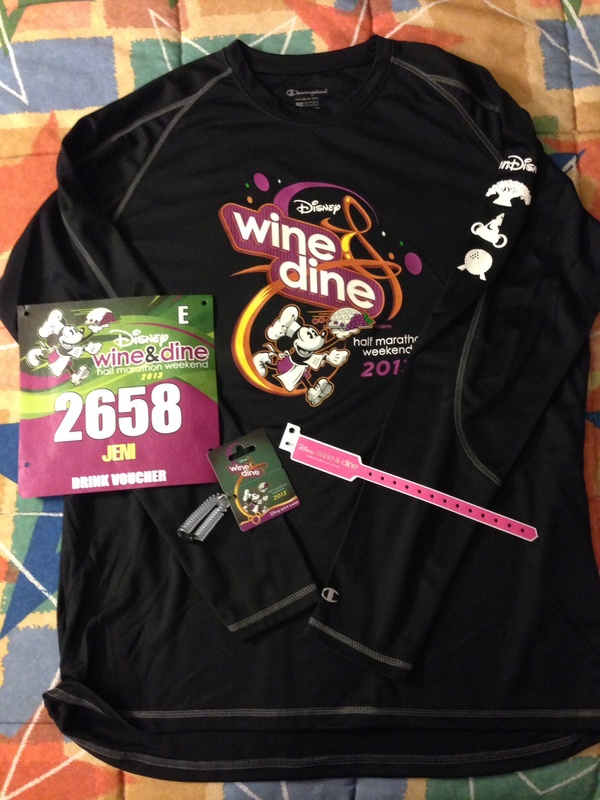 The race was Saturday night so I really had to plan out my day so I’d be good to go at race time. 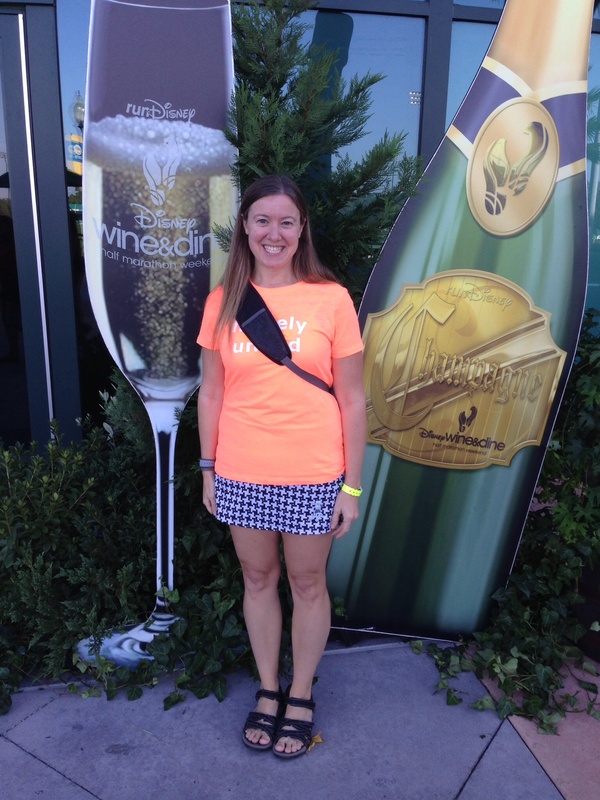 I got up early, had breakfast at the hotel, and hot up the expo again for a few hours. 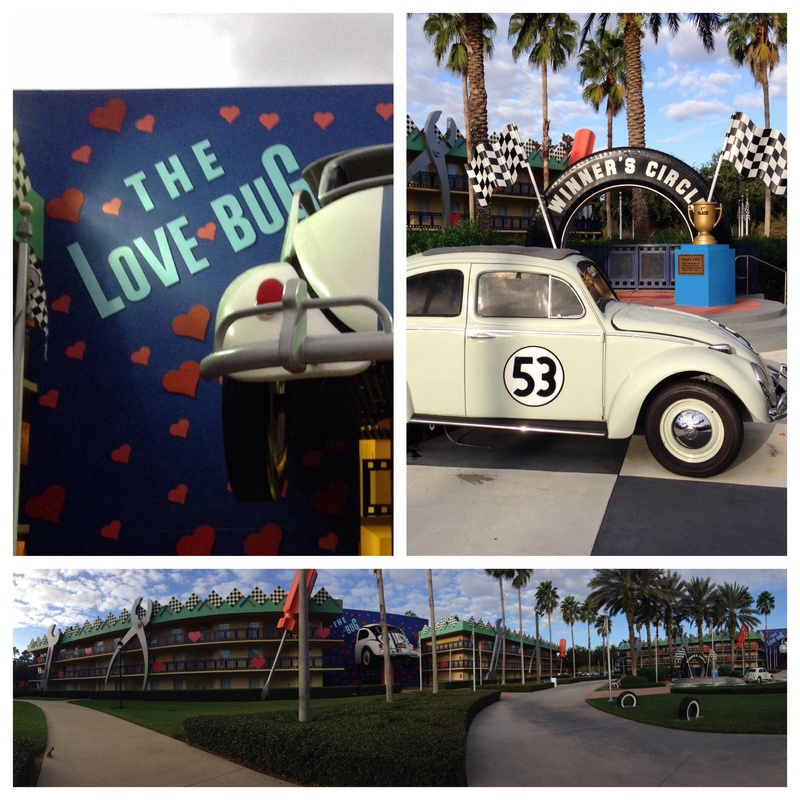 After the expo I went to Downtown Disney for lunch. 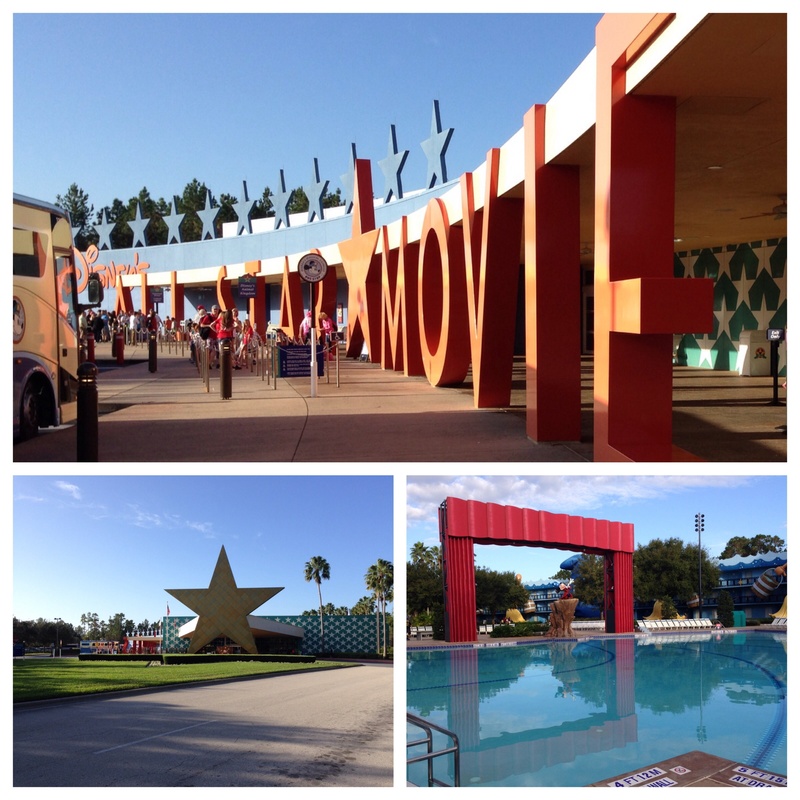 It was fun to walk around, shop and enjoy the beautiful Florida weather. Around 3pm I went back to the hotel to chill and rest up for the race. 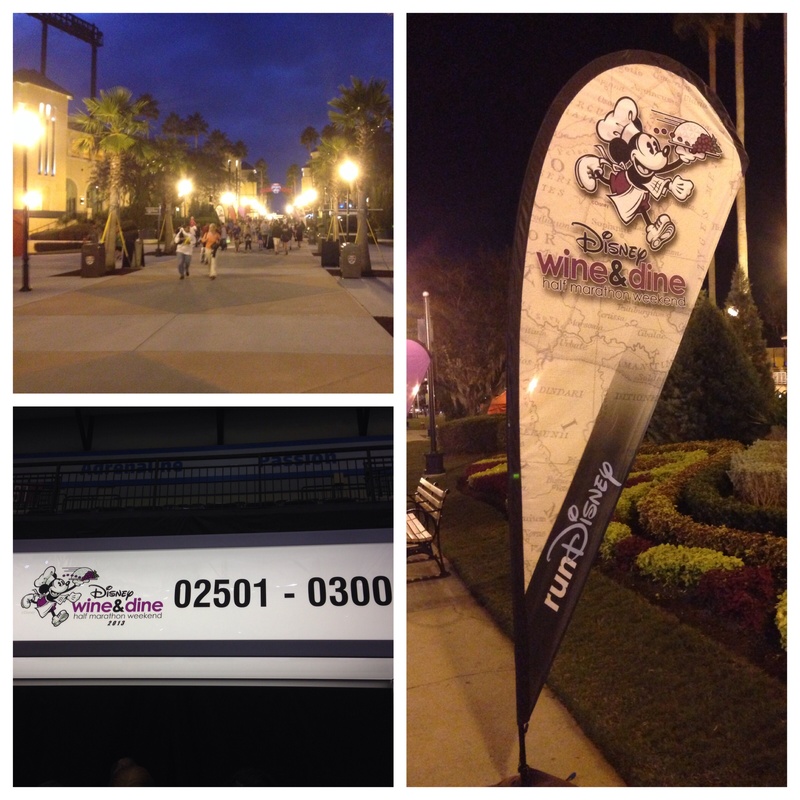 At 7pm I boarded the bus for the race start, I was nervous and excited for the race. 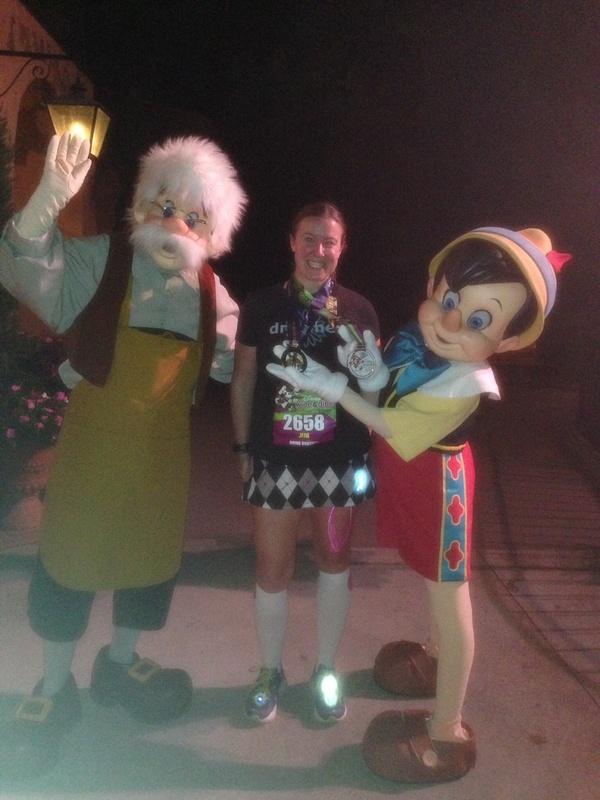 I had lots of time to walk around before the race start, I got in line to get character pictures. 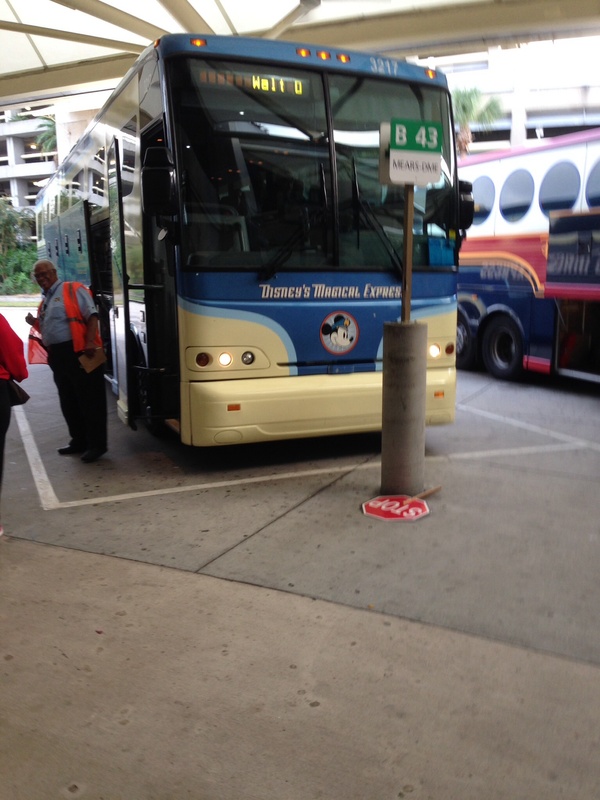 After waiting for a while we headed over to the corals, more time to wait, a 10 pm start means lots of waiting. The race started right on time, I was in coral E, so I didn’t have to wait long to start, the corals were smaller which was great, not as congested at the start. 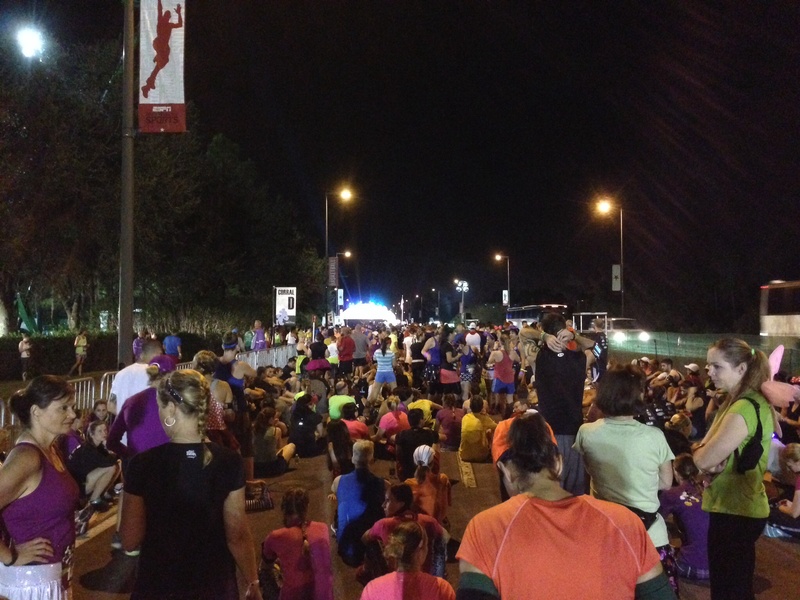 The first park we ran through was the animal kingdom, we ran 3 really boring miles before we go to the park, the problem with this race is that there are not really any spectators and it’s dark so you can’t really see much. After animal kingdom was several more boring miles, around mile 9 we headed into Hollywood studios, which was very pretty with the Osborn Family lights, then the boardwalk and finally Epcot. 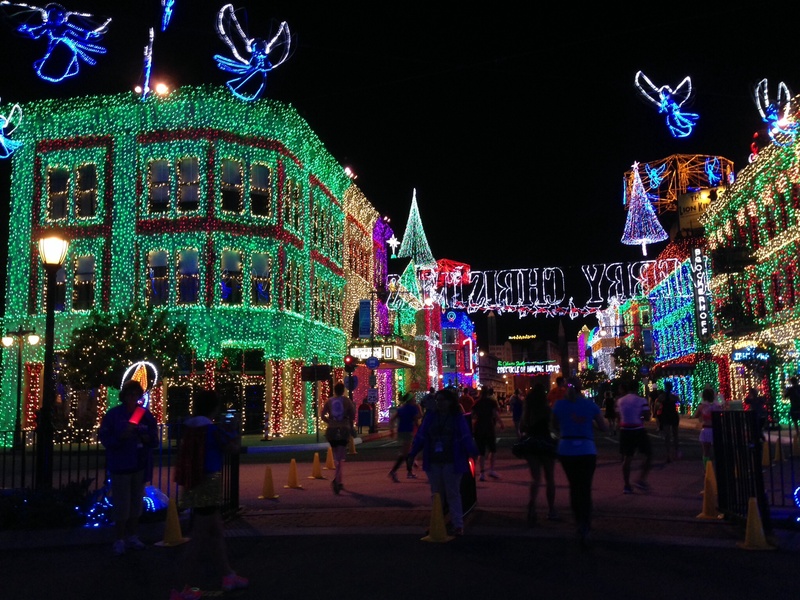 Osborne Family Lights, so so pretty to run through. 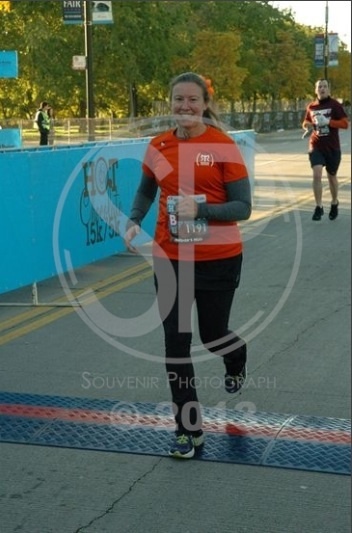 more smiles, this was a fun race! I did it! And I got my coast to coast medal! 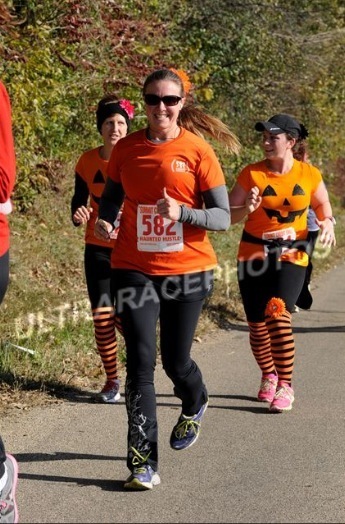 It was a pretty fun race, not my fastest or slowest, but still fun! After the race Epcot was open for eating and drinking. 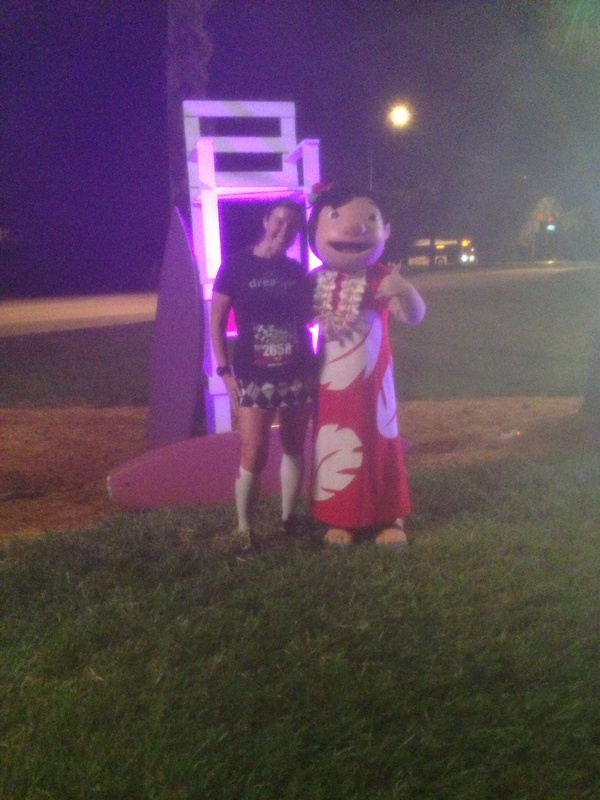 I almost didn’t go since i finished the race around 1:30am, but I decided I should walk around and get something to eat (you had to pay for food, but they did give us a $10 card we could use) I also met a few more characters while I was walking around. 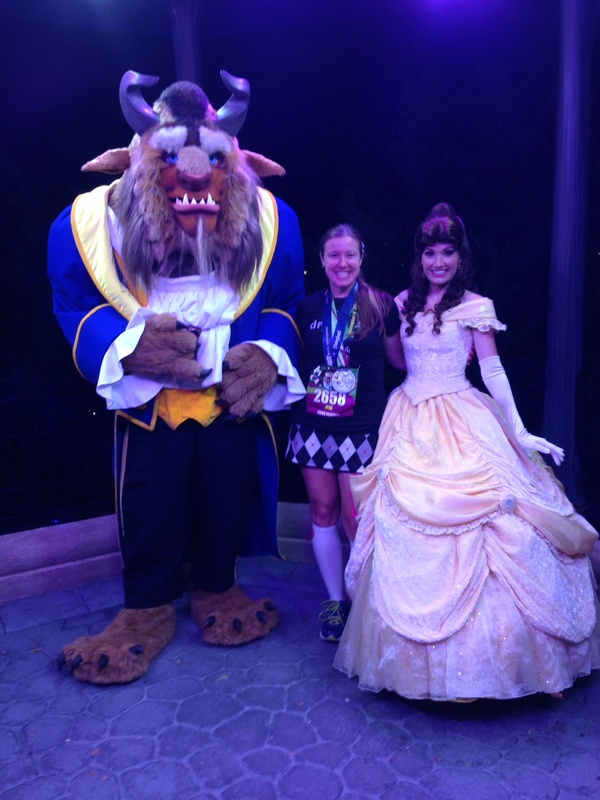 I walked into Pinocchio and Gepetto and went to meet Belle and the Beast. 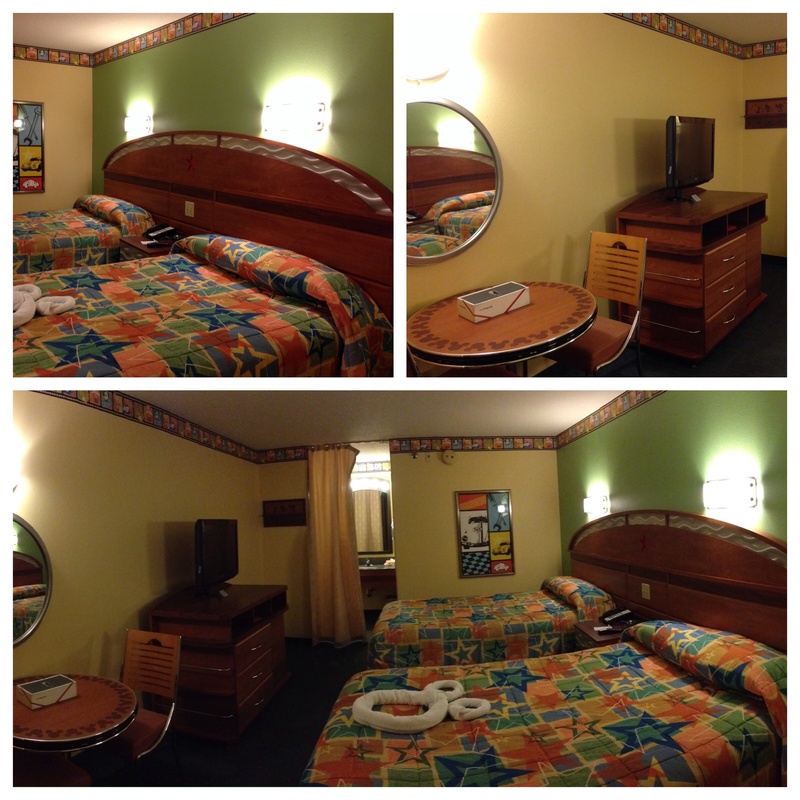 By 3:30am I was back at my hotel and ready for a shower and sleep. 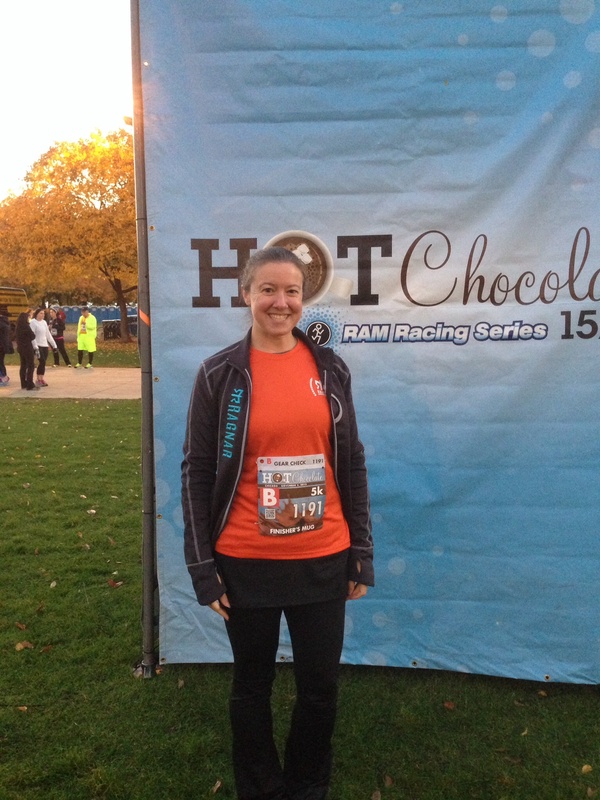 Just over a week ago was the Hot Chocolate 5k in Chicago. 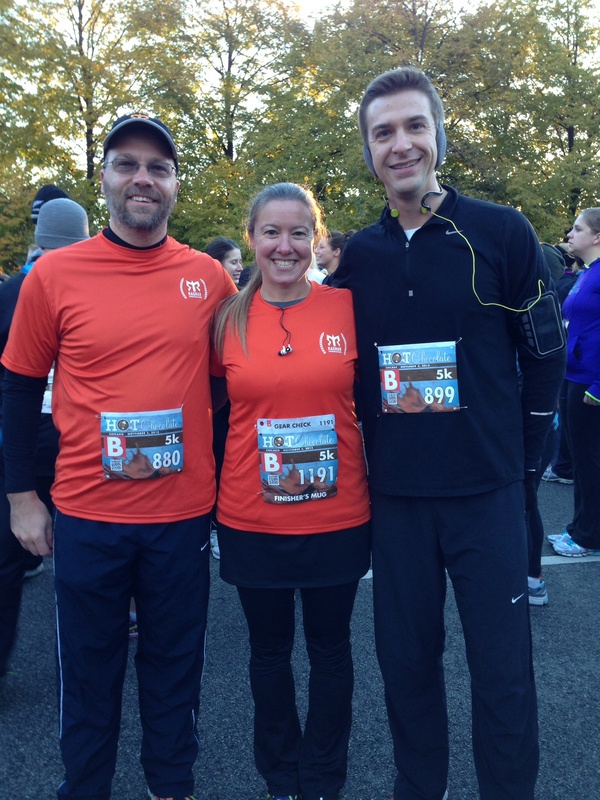 Many members of the Kenosha running club were also running this race. 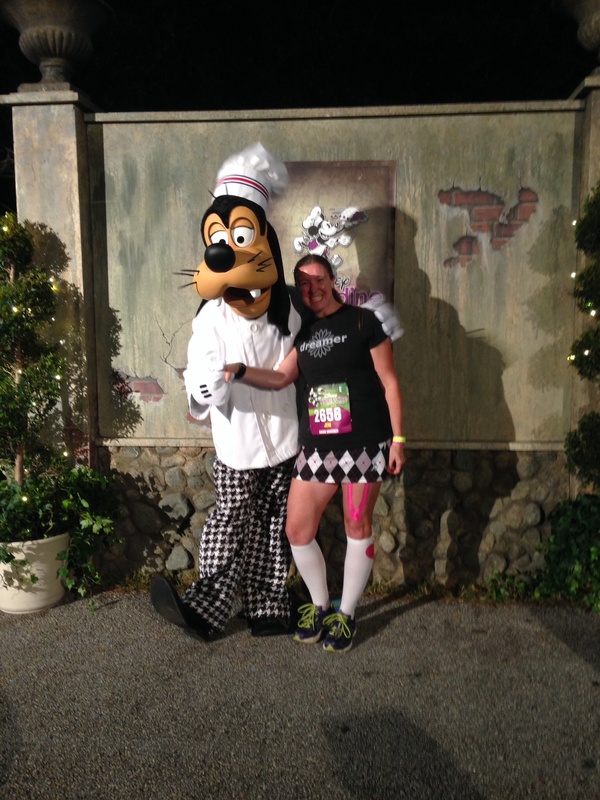 It was my 3rd year doing this race, there have been hiccups the past two year, but this year went great. I was going to ride down with some members of the club, but ended up riding down with Chris. Chris and I before the race, he’s not as smiley as me. 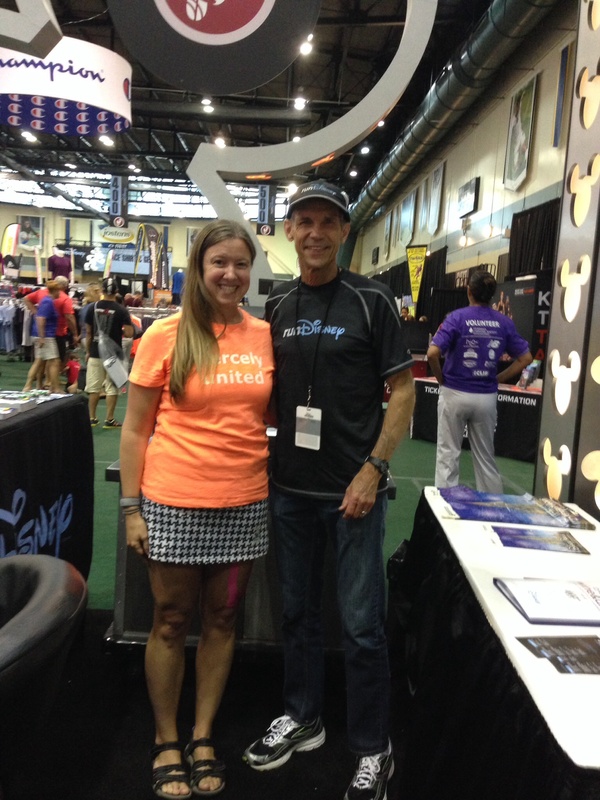 I also ran into Andrew, another Ragnar ambassador in the start coral, we ran together for most of the race. 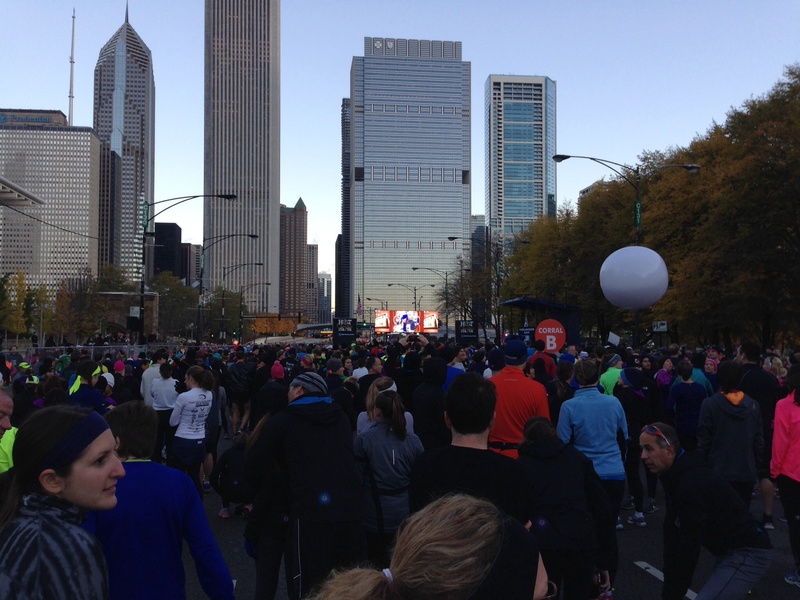 I finished the race in under 30 min, my leg felt great and Chris and I spent the rest of the morning walking around Chicago, perfect way to spend a Sunday. 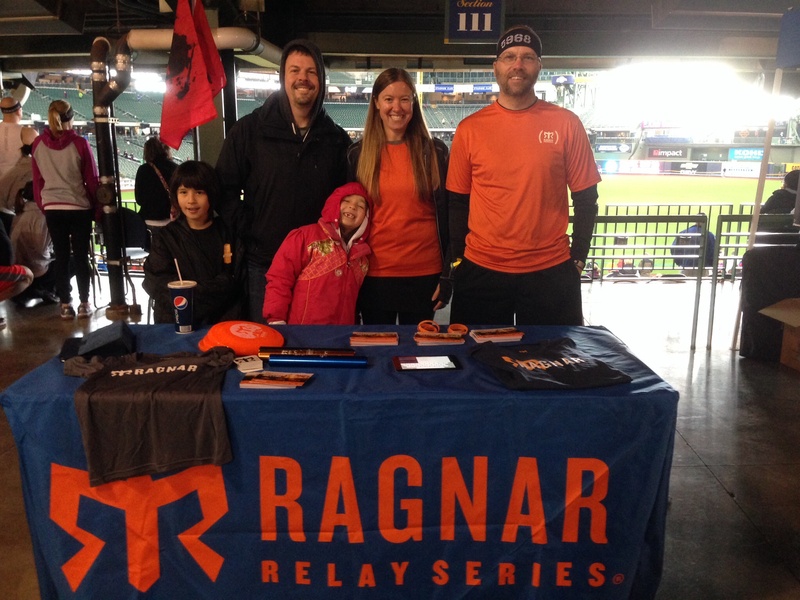 Saturday I volunteered to help man a booth for Ragnar, it was my first Ambassador event. 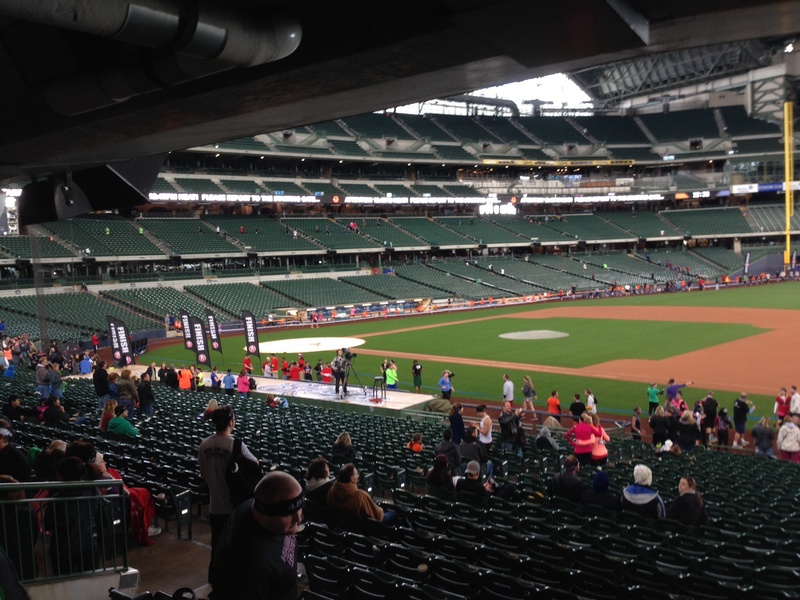 We had a table at the Spartan Race Milwaukee held at Miller Park. I had never been to a Spartan event before so it was really cool to see and learn more about the event. 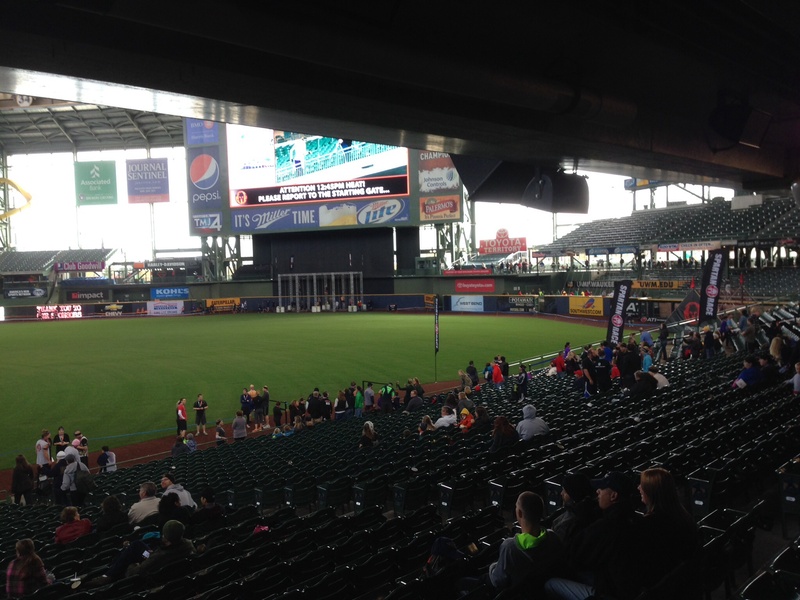 This was a Spartan sprint, so the shortest of the Spartan races, it also had no mud or water, it was mostly inside of the stadium, and the participants finished at home plate. 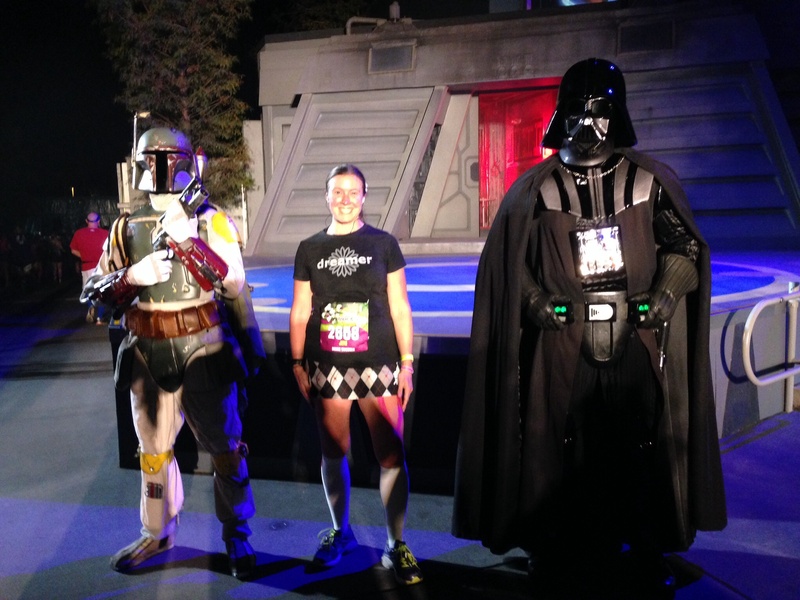 Very cool to watch and I even got to see one of my Ragnar teammates from last year who was running the race. 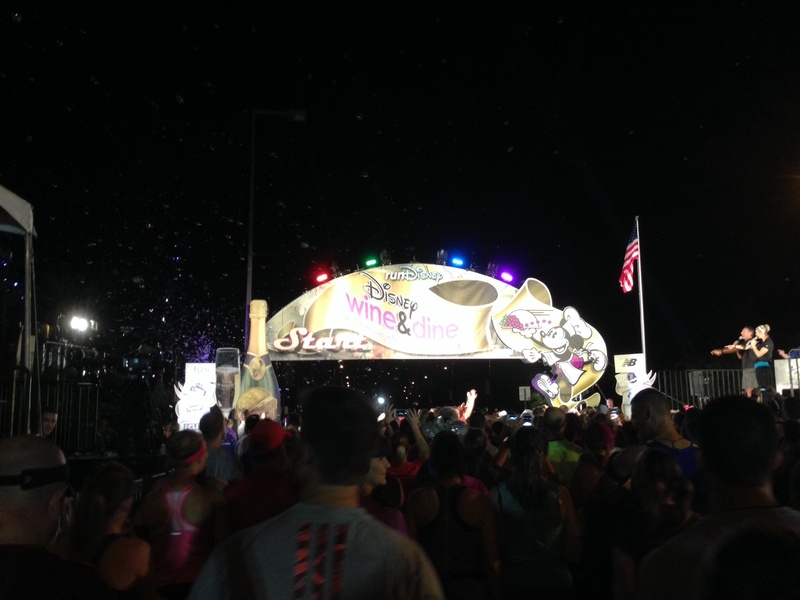 After a busy weekend of race expos, working at a race and running a race… This will be one of a few updates. 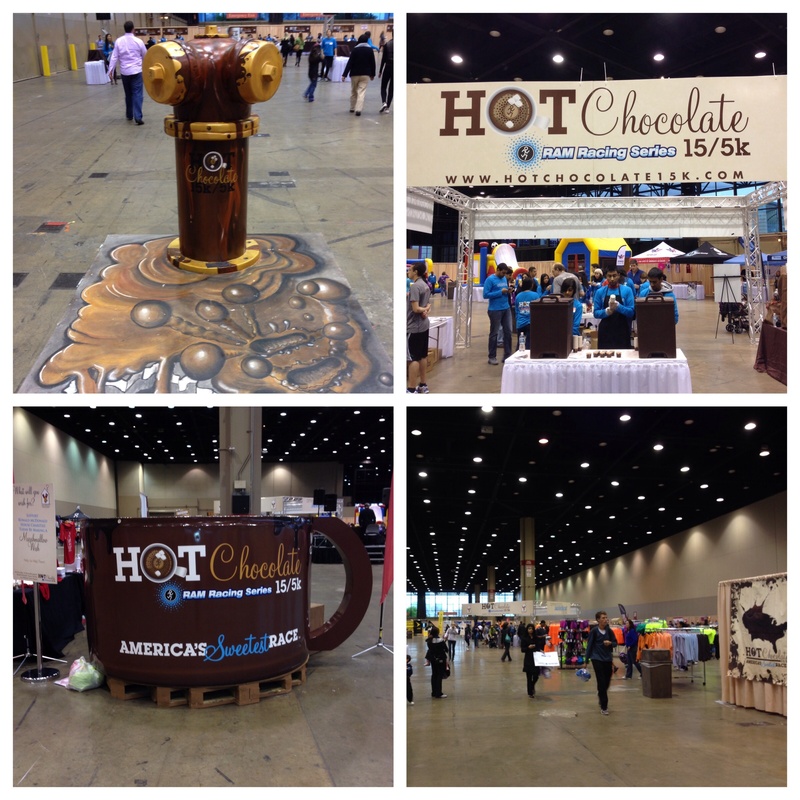 Friday I headed down to Chicago on the metra, then over to McCormick Place to volunteer at the Hot Chocolate Chicago 5k/15k expo. I volunteered so I could also pick up my packet since there is no race day pickup, I also ended up picking up a few other peoples packets. It was a fun afternoon and a quick trip to the city. I took a few pics at the expo. 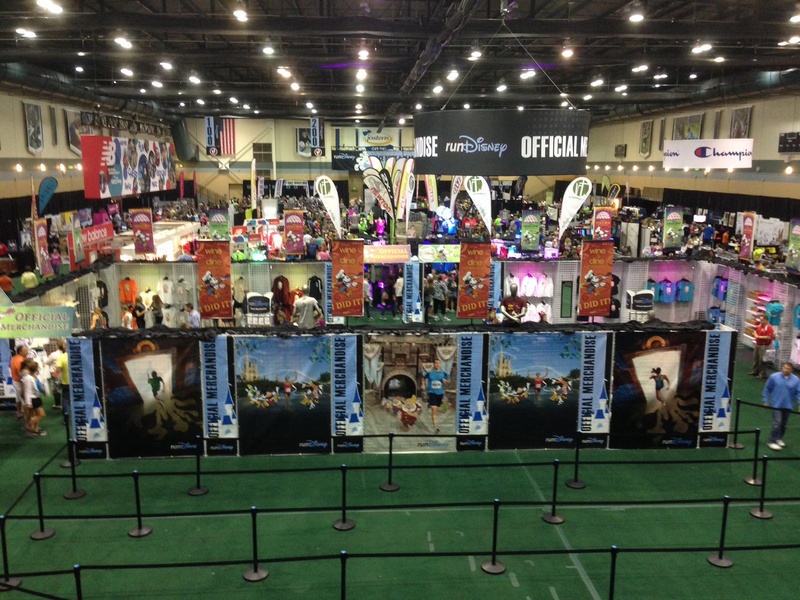 The expo was much more organized this year. I was directing people and checking fitting rooms for the afternoon. I also bought a couple things! 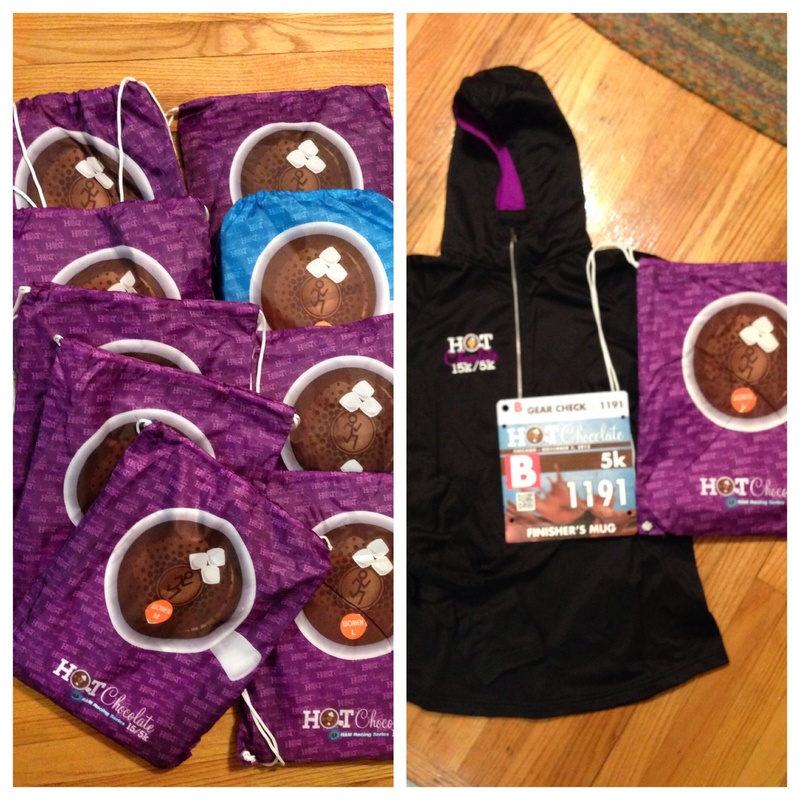 Some of the packets I picked up and my cute hoodie from the race. 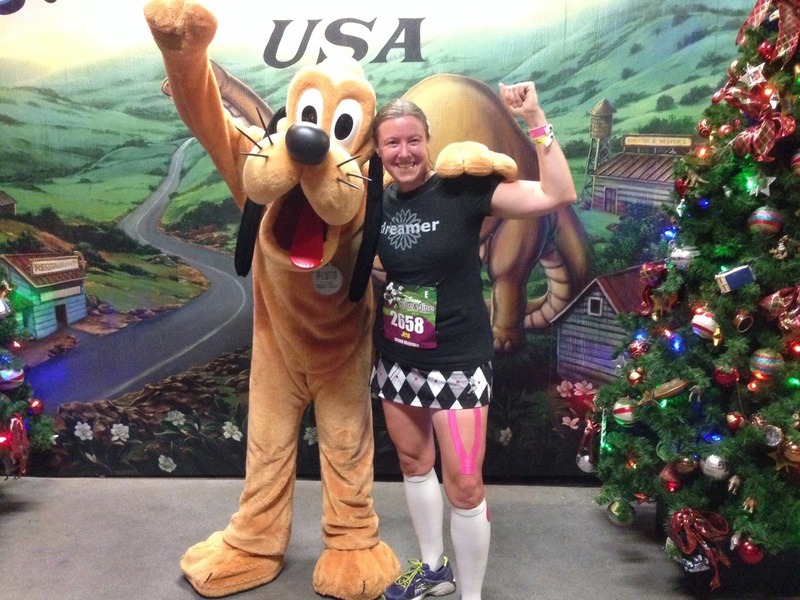 Sunday was my 12th half marathon for the year… still can’t believe I made it to #12, it has been a year of ups and downs, Injury and disappointment along with many, many happy moments. I was feeling pretty good going into this race. 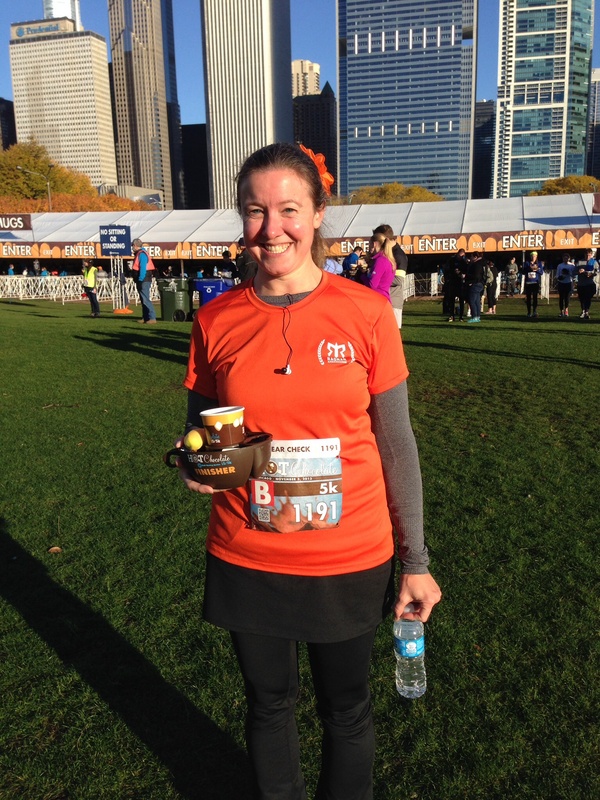 My DNF was a month behind me and I had completed the Empire State Half the week before. I hadn’t trained much, just one 2 mile run earlier in the week so I knew my endurance wouldn’t be great, but I also knew that my leg is still not 100% and needs more time to heal so I was planning to run slow and conserve my energy. 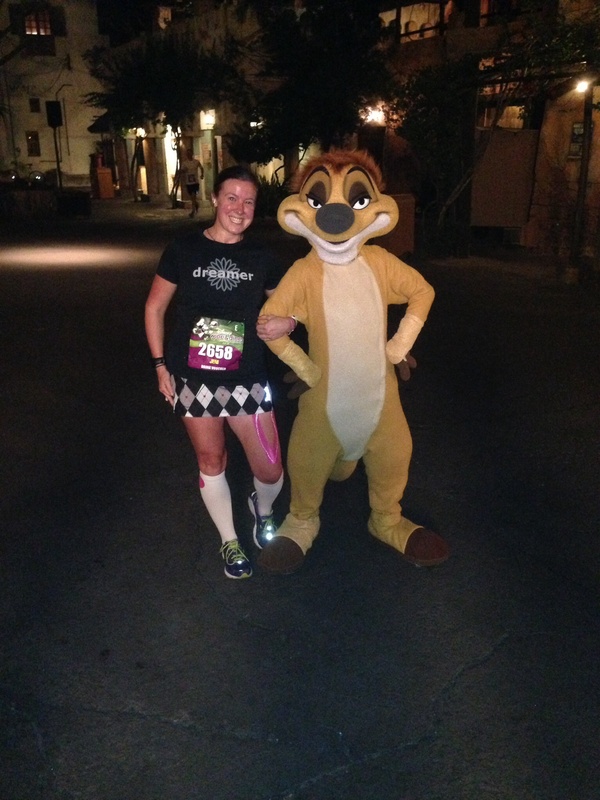 My goal was a 10:00-10:30 pace, which I was able to maintain for about 85% of the race so I was pretty happy. 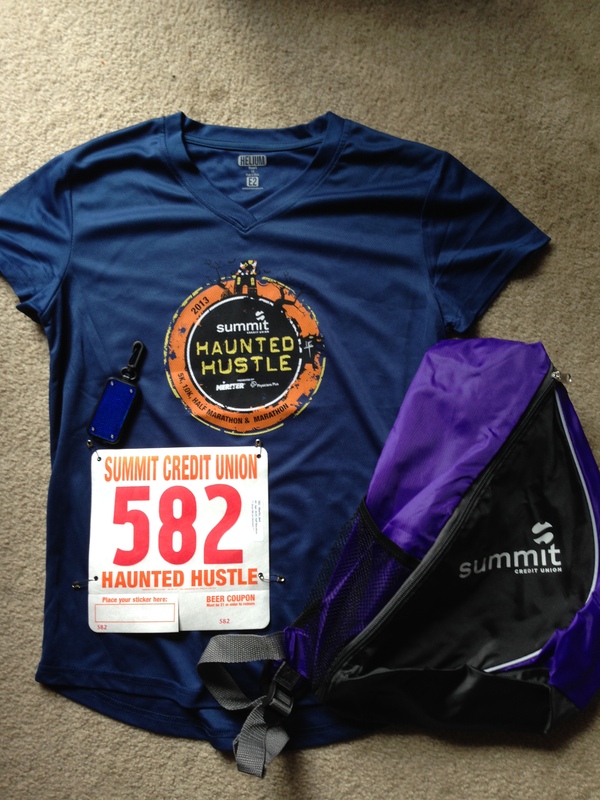 The day before my race I went and spectated the Skeleton Skamper 5K and half in Racine, I have run this race before so I didn’t sign up for it this year. 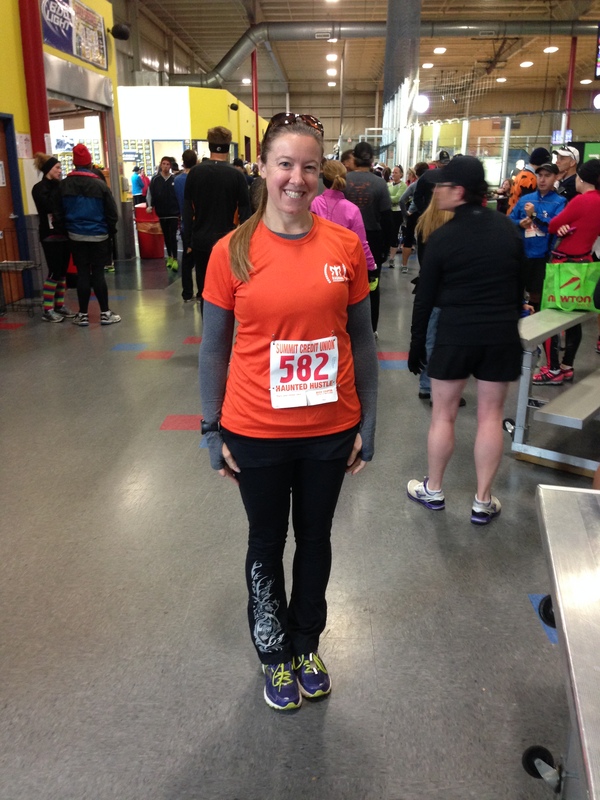 There were several members of the KRC and OFG running the race so I got to see lots of amazing runners set out to meet and exceed their goals. 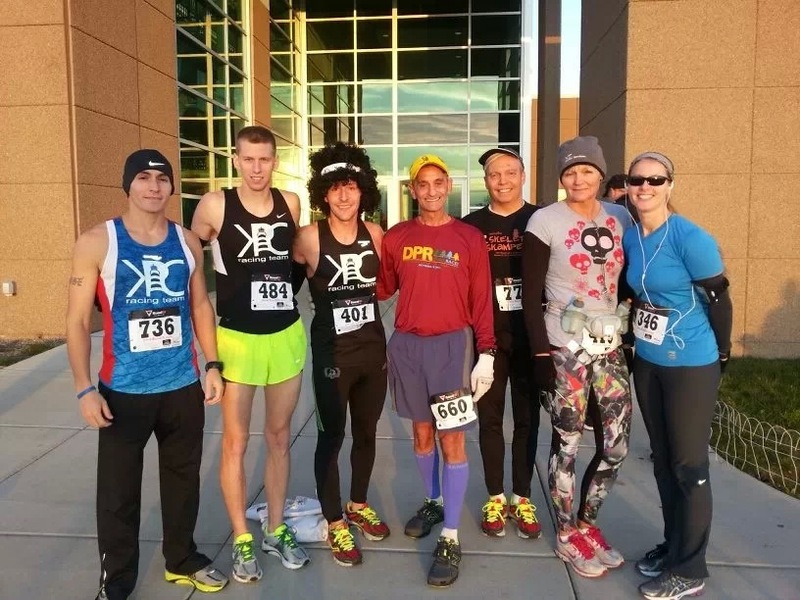 KRC group before the race! This Haunted Hustle was just outside of Madison so I got some family time too. 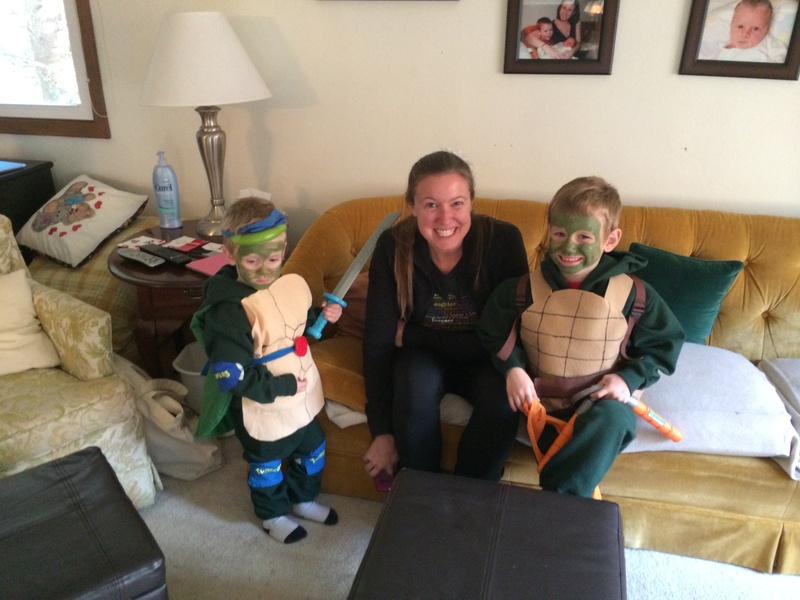 Spent Saturday evening with two pretty cute Teenage Mutant Ninja Turtles after I went to packet pickup. The race, it was chilly Sunday morning, but less wind than the day before so that was good. I arrived super early since I wasn’t sure of the parking situation, the full started 1 hour before the half, so I got there about 15 min before the full started. 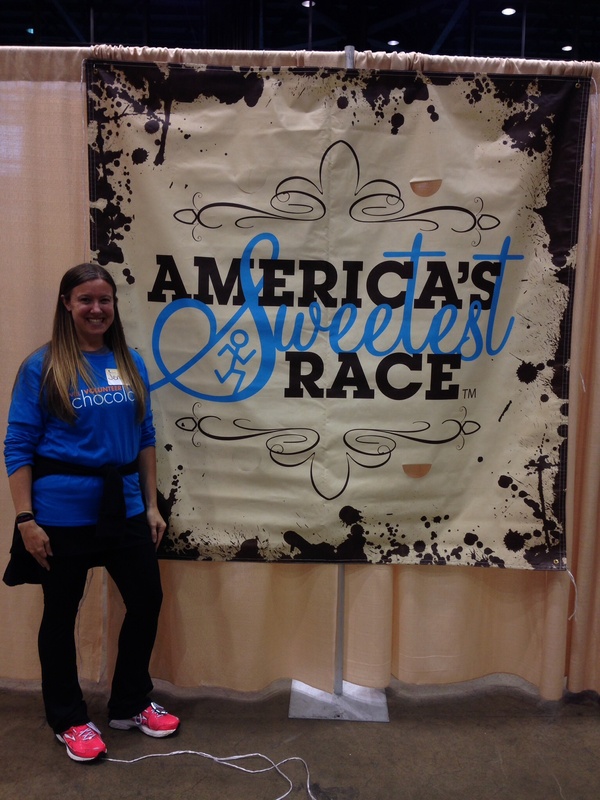 Luckily we could hang inside of the Keva center and keep warm (and use real bathrooms pre race!) 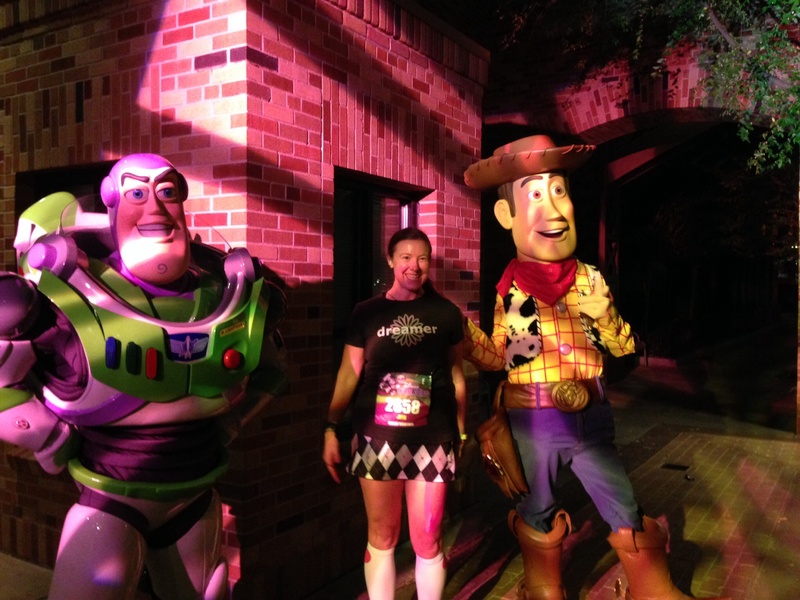 it was really fun watching everyone come in with their outfits, Halloween races always have some great costumes. 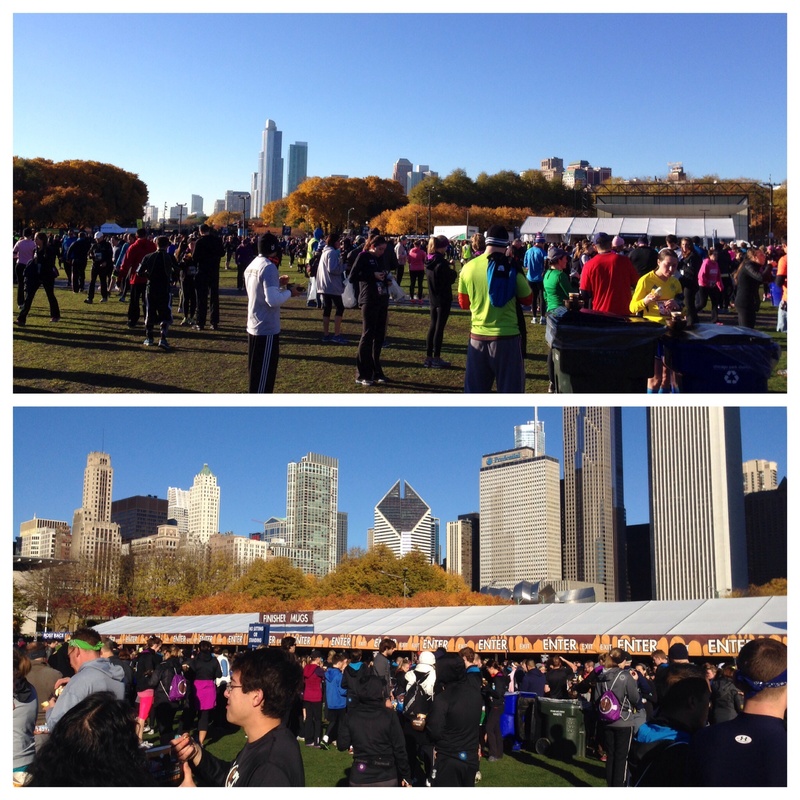 The race started at 9am and it was chilly, only around 36 degrees at race start, not very windy which was great. 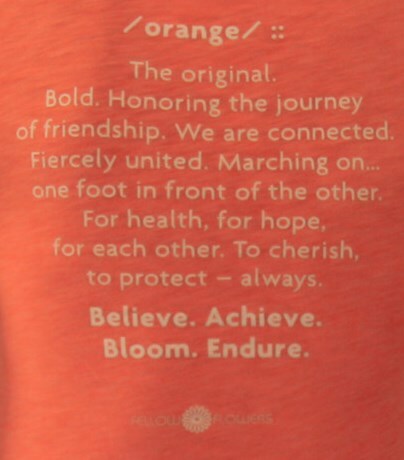 I got going and felt pretty good, the first few miles flew by, and right around mile 3 I had a really great surprise, I saw Mel from Fellow Flowers, I smiled even bigger and gave her a high five. 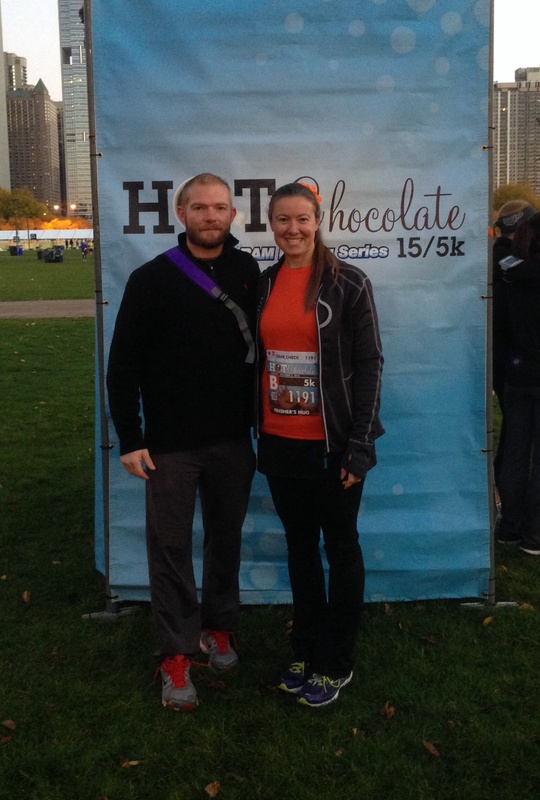 Seeing someone you know on the course unexpectedly is the best adrenaline rush I could have had during the race. I was totally pumped after seeing her. 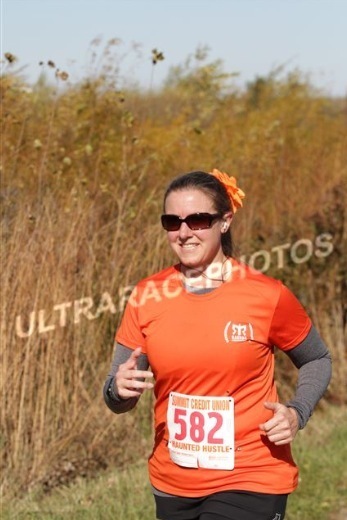 I was also wearing my orange flower for the first time in this race, so even better. After mile 3 we were on a trail, it was so pretty and nice. I really enjoy running on a trail, plus it’s nice switching it up from pavement to crushed gravel/limestone. There were even some wooden bridges that we ran across. Very pretty area and a nice change from running on streets. The trail continued for a bout 3 miles, then we were out near a few farms, and you could smell the farms…ewwww!!! As we got closer to mile 9 we were heading back towards the Keva center and the airport, I really enjoyed the combination of road and trail in this race. 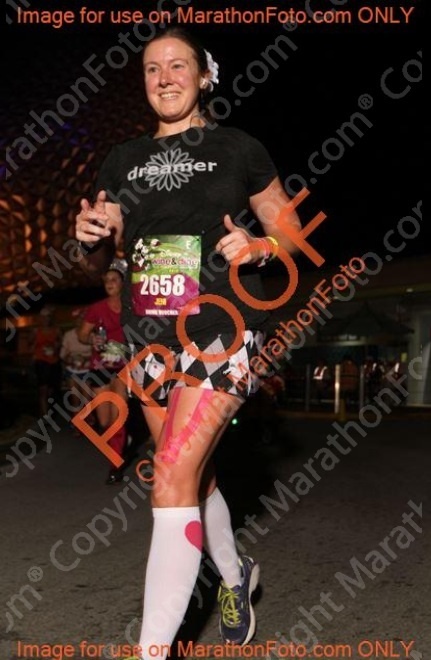 Around mile 9 I started to slow down and began run/walking. It also got windy on the course. 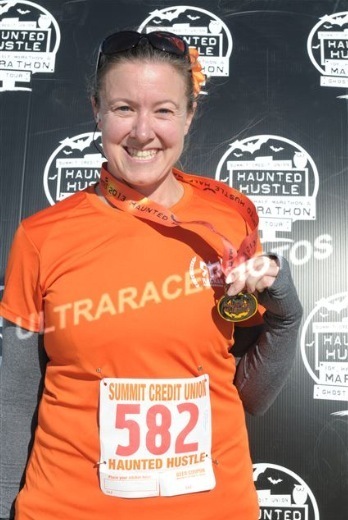 I ended up finishing with a time of 2:28:14 not my best, but not my worst! 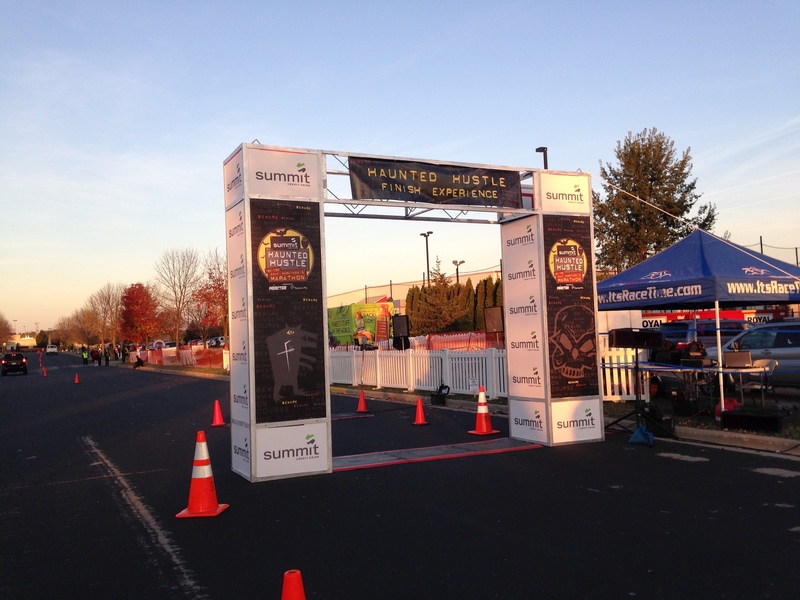 It was a really nice course and a race that I would definitely do again. 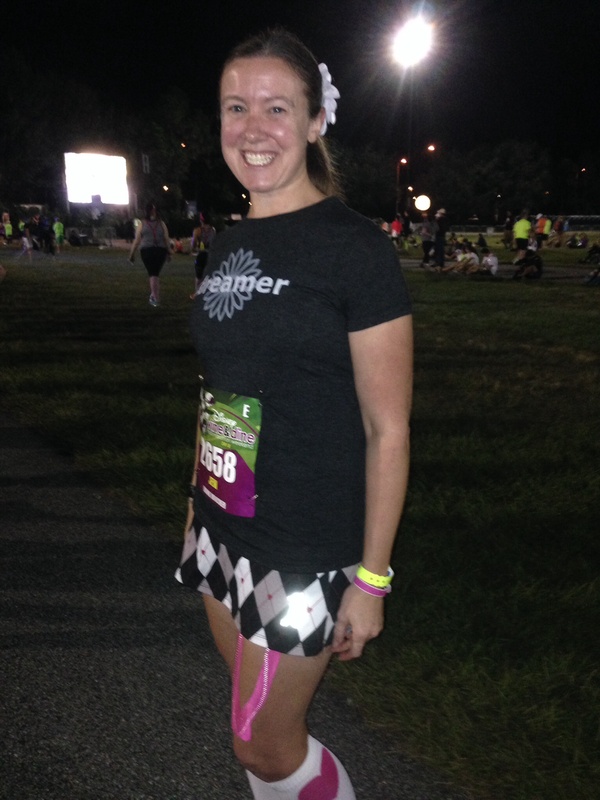 around mile 9, the two ladies behind me also have flowers on, they passed me after a bit!